SEPTEMBER 12, 2008  Winter color guard has a big fan in the world of entertainment. Heather Henson, daughter of Muppets founder Jim Henson, is prominently featuring flags and props inspired by winter guard in her elaborate stage show titled Panther & Crane. "It's a puppet show embedded in a collage of dance and animation," Henson says. "I love using all the senses to create emotion and mood. I also love spectacle with meaning, so there's a story line about the environment. It's all done in service to give people a sense of harmony and a sense of beauty of nature." 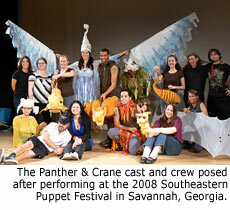 The hour-long Panther & Crane has been performed several times for festivals and special events. Henson continues to refine the show and hopes to make it available to a broader audience. "It's still in development and every time we do it, it's a work in progress," Henson says. "We're trying to get it down to a small enough cast that can be economical to tour." The show's combination of color guard and puppetry is not unusual for Henson, who continually experiments with new ways of expressing movement. "I've always been intrigued with manipulating objects and finding things that will move beautifully," she says. "I studied animation, where you break things down and study the way they move. But because I'm also from the world of puppetry, there's a lot of movement that I love to work with that can only be done live." Henson has experimented with many types of movement. In theatre she worked with making confetti move in different ways. She even experimented with liquids on overhead projectors. "Some experiments failed, like the time I got a snowmaker and used blacklight snow material. I was trying to do a dance where we would manipulate the snow with big fans. It didn't work at all! But it was interesting and I kept trying to do new things." Henson first heard about winter guard when a percussionist friend told her she might be interested in the guard activity. She went online and was thrilled to discover the art form. "I looked at all those amazing videos. I had no idea! I was completely impressed with that world," Henson says. Henson eventually bought some flags to put into her show, but she had not yet been trained on guard techniques. "I gave the flags to my performers and said 'OK, wave them around, do something.' It wasn't going very well!" Fortunately, she was reconnected with choreographer Genevieve Bernard of Voci Dance in Orlando. The two had met years earlier but at that time Heather didn't realize Genevieve had a background in color guard. Genevieve's credentials include instructing Field of View Winter Guard and performing with The Cadets Drum & Bugle Corps. "Genevieve was amazing. She had great information," Henson says. "We brought Genevieve in to choreograph the flag section in our first show. She made it look a lot better." As Panther & Crane evolved, the collaboration became even stronger. Genevieve trained the dancers and put flag movement throughout the show. Heather added other objects for the dancers to work with. "We use bird wing flags that are dyed to look like feathers, and we have cloud flags that are hand-dyed. We also have angel wing flags that are like swing flags on a J-pole," Henson says. Large tarp flags are used to provide visual and audible enhancement during a storm sequence. "We like the sound of the tarp flags. They're hard to handle because they're heavy. The performers have to use a ton of muscle when they're swinging the tarps back and forth. I love the look of the body when it's working against an object, the push and pull." The environmental theme for Panther & Crane grew from Heather's love of nature. She explained this passion while paging through a journal of sketches she had made in preparation for this interview. The sketches were skilled interpretations of water flowing and grasses moving in the wind. "The basis for a lot of my artwork has been nature. I love seeing form and function. I love seeing patterns in nature such as flow patterns in water, growth patterns in shells, growth in leaves. I think I've always been looking for patterns." "I was always intrigued with unison movements of parades," Henson adds, recalling her exposure to the Macy's Thanksgiving Day Parade from a young age. "With almost anything, once it's repeated and done multiple times it becomes beautiful. I think that's what happens a lot in winter guard. You do one thing, but you do it in multiples and you do it in sync, and it's gorgeous." Heather is involved in multiple projects through her company, Ibex Puppetry. 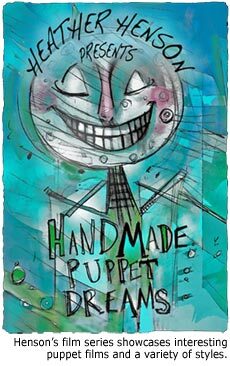 She produces a film series called Handmade Puppet Dreams as an effort to bring broader exposure for cutting-edge puppetry on film. "There are lots of interesting puppet films that get lost in the cracks. They don't make it into animation festivals because they're live action. They don't make it into live action festivals because they're quirky and they look a bit too much like animation," Henson explains. "I put them all together and we have our own little festival." "This process has made me appreciate my father's work even more. I think my father was a master of puppetry on film. He really did hone it. He made puppets that were specifically made to be seen close up on television or film. Their faces have so much articulation, so much emotion. I think Sesame Street and The Muppet Show are some of the best examples of puppetry on TV or film. But with Handmade Puppet Dreams, I'm trying to show that there are other things out there besides the Muppet style, so I tend to show other styles that don't have as much exposure." Ibex also produces the annual Orlando Puppet Festival and strives to present monthly programs for the Orlando community, ranging from children's shows to edgier puppet "slams." Henson is open to deeper collaboration with the winter guard activity. She talks excitedly about the winter guard videos she has purchased or viewed online, and she is pleased with the beauty even simple flag movement has added to Panther & Crane. In the future she has dreams of raising the level of flag technique in her show. "I'm completely enamored of the skill in winter guard," Henson says. "People practice all day long for days and days. The dedication is extraordinary and the level of creativity is wild." 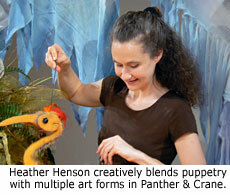 For more information about Heather Henson's work and for news about future performances of Panther & Crane, visit IbexPuppetry.com. Photos by Marching.com. Logo image courtesy of Ibex Puppetry.